Much has been explored about physical sound. Let us now delve into some divine aspects of this element. Sound is caused by energy emitted in the form of a vibration resulting in hearing sensation. The amplitude (volume) and frequency (pitch) of the sound wave depends on what the source is and the amount of energy supplied outwards. Sound needs a medium to travel such as gases, liquids or solids and travels faster through solid objects because the molecules pack more tightly and don’t have to move a great distance to bump and transmit the vibrations. The speed of sound is highest in solids, less in liquids and least in gases. Like light, sound too undergoes reflection from a surface. The angle of reflection is equal to the angle of incidence, with the reflected wave, the incident wave and the normal at the point of incidence all lying in the same plane. The reflected sound is called an echo, and whether the echo is heard or not depends on the speed of sound and the distance between the source or observer and the reflector. In a closed enclosure, one can hear multiple sounds (echoes) even after the source stops sound production due to multiple reflections at different points on the enclosure. Sound reflection is used in medical devices, and doctors listen to their patient’s heartbeat and lungs to diagnose illness. In humans, the vocal cords produce sound which is heard through ears. The human ear consists of three parts – the outer ear, middle ear and the inner ear. The outer ear consists of a pinna that helps in sound capture; the middle ear hosts a vibrating membrane like a stretched rubber sheet and an auditory canal, hammer and anvil that amplify the incident sound, the inner ear consists of an auditory nerve that converts the amplified sound into electrical signals and sends it to the brain for perception. That’s quite complex, isn’t it? The complexity of the human ear, intelligently designed to hear within certain frequency bandwidth, in its normal functioning state is better than the best and most expensive artificial ear which incidentally also needs an intelligent designer. How can then we assume that there is no intelligent designer of the human ear? And if the human ear needs intelligent design what about this gigantic cosmic manifestation? The faculty of hearing is not supposed to be limited to understanding the material creation. Sruti, the science of hearing the Vedic literatures from the mouth of a pure devotee, is so powerful that it revives the living entity’s memory of his eternal relationship with the Supreme Personality of Godhead. Under the influence of illusory maya, we have forgotten this eternal relationship. When a pure devotee speaks, the articulation may resemble the sound of this material sky, but the voice is spiritually potent. A conditioned soul should hear a pure devotee’s message, for he is fully surrendered to the Lord’s lotus feet and without material desire, speculative knowhow, or material contamination. The sitar provides an interesting analogy for understanding the qualities of a pure devotee. There are two kinds of strings on a sitar: main strings and sympathetic strings. A main string creates resonance, and increases the intensity of sound by setting off vibrations in the sympathetic strings. The vibrations of the main strings provide a wide range of sound to which the sympathetic strings respond even though set to different intonations. Similarly, a pure devotee’s Krishna consciousness resonates in such a way that people from diverse cultural background and psychophysiological natures can all easily take to Krishna consciousness. Sankirtana, congregational chanting, being transcendental sound can be distinguished from mundane sounds. The mundane sound is always different from the object designated by the sound. Sankirtana descends from the transcendental world just so that the transcendental names of the Lord are audible to our imperfect senses. He descends by His inconceivable mystic powers, in the form of transcendental sound. We can receive Him by a submissive aural reception. However, there is no distinction between Sri Krishna and His name, fame, quality, and paraphernalia, because He is completely transcendental. The essential transcendental sound is trapped in our consciousness when the source of transmission is a pure devotee. The quality of sound we hear is of paramount importance, for it affects our consciousness. Because God has no mundane qualities, His name is not a mundane sound. Sravanam, or hearing the transcendental name and glories of Lord Krishna , when adopted by any conditioned soul, automatically cleanses material contamination and enables realization of our original constitutional position. Without hearing sufficiently and properly, no progress in devotional service is possible. It is to facilitate attentive hearing that Vyasadeva compiled all Vedic literatures. The Srimad-Bhagavatam advocates nama-sankirtana as the essence of religion in this age of Kali. This sweet transcendental sound is a special creation of the Lord known as prema-sankirtana, congregational chanting in love of Godhead. Hearing is more important than directly studying or perceiving. If one attentively hears from the right source, perfect knowledge is received. This process is called Srauta-pantha, or the acquirement of knowledge by hearing from authorities. All Vedic knowledge is based on the principle of approaching a bona fide spiritual master and hearing from the authoritative statements of the Vedas. One need not be a highly polished litterateur to receive knowledge from a perfect person; one must be expert in hearing. This is called the descending process of deductive knowledge, or avaroha-pantha. What is it that one should do on receiving the seed of devotional service by aural reception? Sri Caitanya-caritamrita (Madhya 19.152) states: mali hana kare sei bija aropana sravana-kirtana-jale karaye secana – one ought to take care of the seed sowed in the heart like a gardener, while watering it through hearing and chanting. The seed will begin to sprout. The hearing ability in the individual spirit soul is far less compared to that of the Supreme Lord. In Srimad-Bhagavatam (2.6.3) Lord Brahma says about the virat-purusa [universal form of the Lord]: karnau disam ca tirthanam srotram akasa-sabdayoh: “His ears hear from all sides and are receptacles for the Vedas, and His sense of hearing is the generating center of the sky and of all kinds of sound.” However, despite our very limited hearing ability compared to the virat-purusa, because the transcendental sound of the Hare Krishna maha-mantra is absolute, our nominal hearing ability is not a hindrance in achieving perfection in devotional life. The success of the aural reception of the Hare Krishna maha-mantra rests on the mercy of the pure devotee who bestows the transcendental knowhow. The receiver simply has to desire to receive the mercy wholeheartedly and nurture it. In the material world, sound is relative – a word is different from what it signifies. I may say “water, water, water,” but the real substance water won’t manifest to quench my thirst. But spiritual sound is the same as what it signifies. The name Krishna is Krishna Himself. There is, however, an essential difference between the material and transcendental sounds which is interesting to note. The speed of sound is more in the solid medium than in gas. However, the journey home, back to Godhead which depends squarely on the aural reception of the transcendental sound, is faster when the heart is softened through the strict adherence to the rules and regulations of devotional life. A vraja-vasi poet glorifies the gopis’ softened heart and likens it to butter, which is very dear to the Supreme Lord. Purer the heart, more it is in sync with the transcendental sound vibration. A pure heart is said to be soft like butter, whereas an impure heart is hard like a stone. Sughosa, the conchshell of Nakula, literally means “that which makes a pleasant sound.” To create pleasant sounds, many musical instruments are in use. Some instruments produce sound due to vibration of membranes, some due to the vibration of strings, and some others produce sound due to the vibration of an air column. The to and fro or back and forth motion of an object is called vibration. The sitar, vina (carried by Narada Muni), violin, guitar and ektara are some stringed instruments. The tabla, karatalas (hand cymbal), and mrdanga (sweet-sounding drum) are some instruments that work on membrane vibration, and instruments like the flute, conchshell and the trumpet produce sound due to the vibration of an air column in them. Bhagavad-gita (1.12-19) describes the usage of several instruments to convey a message to the opponent at the onset of the battle of Kuruksetra. Bhisma, the grandsire of the Kuru dynasty, blew his conchshell very loudly, making a sound like the roar of a lion. After that, the conchshells, drums, bugles, trumpets and horns were all sounded, and the combined sound was tumultuous. Lord Krishna blew His transcendental conchshell, Pancajanya; Arjuna blew his, the Devadatta; and Bhima blew his conchshell, called Paundra. King Yudhisthira blew his conchshell, the Ananta-vijaya (“unending victory”), and Nakula and Sahadeva blew the Sughosa and Manipuspaka respectively, and the others blew their respective conchshells. The blowing of these conchshells became uproarious and the vibrations shattered the hearts of the sons of Dhrtarastra. However, when Bhisma and others on Duryodhana’s side blew their conchshells, there was no heartbreaking for the Pandavas. Those who take shelter of the Supreme Lord have no such fear. Sound from such instruments is also a means of honoring the Lord. For instance, when Lord Krishna was departing from the palace of Hastinapura for Dvaraka, different types of drums – like the mrdanga, dhola, nagra, dhundhuri and dundubhi – and flutes like the panava and gomukhah, and vinas (string instruments) and bheris (brass band instruments), all sounded together to show Him honor. 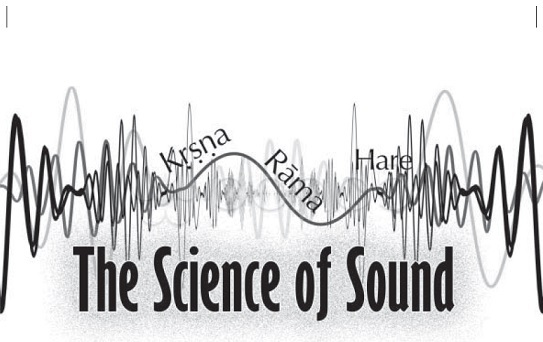 Sound is also a form of evidence but many things are beyond the perception of our imperfect senses; yet the authoritative evidence of sound vibration is perfect. The Vedas are known as Sabda-brahma because evidence from the Vedas constitutes the ultimate understanding for the Vedas represent the Supreme Personality of Godhead. The essence of Sabda-brahma is the chanting of the Hare Krishna mantra. By vibrating this transcendental sound, the meaning of everything, both material and spiritual, is revealed. Sound in the form of chanting of the Lord’s names received from the perfect source, His pure devotee, is the means of deliverance from this material world in this dark age of Kali. Damodara Nityananda Dasa (Dr. Dipankar Deb) is a disciple of His Holiness Bhakti Vikasa Swami. He holds a PhD in electrical engineering from the University of Virginia. He is the author of an upcoming book, Science, Nescience and Perfect Design.